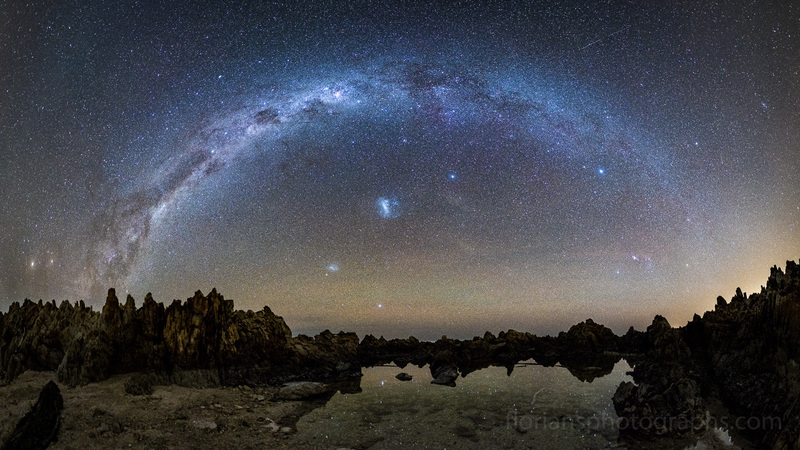 I have tweaked some of my recent night sky pictures, here they are. 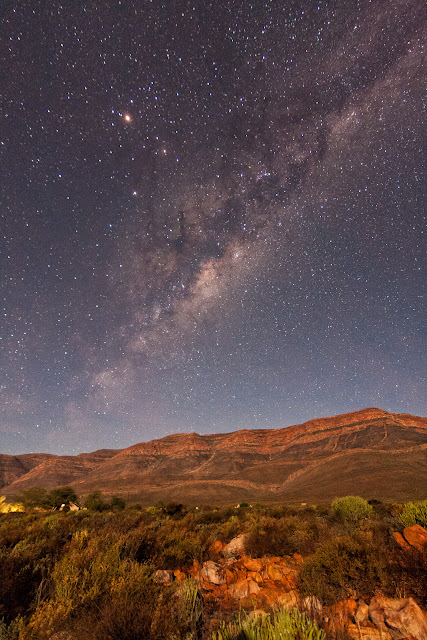 The above shot was taken during a weekend in the Cederberg region. It was taken during a half moon, which is nice for illuminating the landscape, but a little bright for the stars. 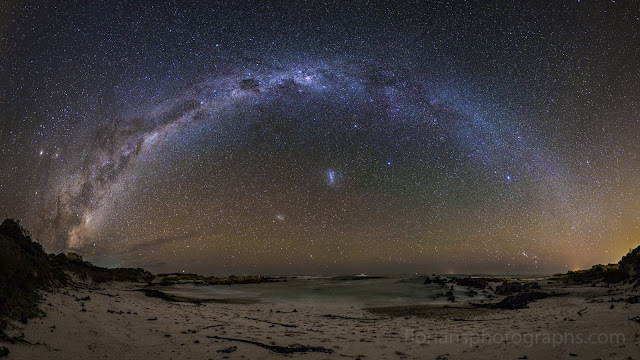 The Magellanic Clouds are visible, but they're hiding among the terrestrial clouds low over the horizon. Here is a single exposure of the same scene. 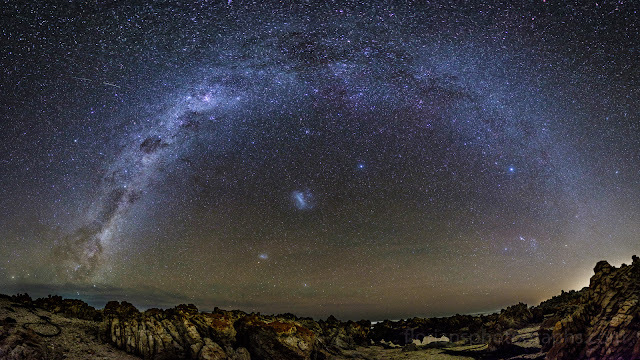 As you can see, the Milky Way is actually quite straight, it is only the panoramic projection in the first image that makes it appear curved (if you project a part of a spherical image onto a flat piece of paper then some distortion is inevitable. That's also why Greenland looks so huge on a world map). I had already posted this shot before, but here I have tweaked it a bit, improving the contrast using the wonderful Color Efex Pro tool of the Google Nik collection, which is now available for free. Also, I cropped it slightly so the aspect ratio is now 1x2, which makes it easier to frame. What I like about this shot is how the sky is blue near the horizon, but darkens to black towards the zenith. The moon was about 35% illuminated, which seems to me the perfect amount. I was lucky enough to borrow the new Fuji X-Pro2 camera, together with the Fujinon 16mm f/1.4 lens (which incidentally scores an astonishing 3826 on the Astro Lens Score, according to this site). I wrote about my experiences here, where three of the next five images also appear. I have again hit them with Color Efex Pro. I'm wondering, though, if the contrast is a little overdone now. Feel free to leave a comment on what you think. The above panorama uses a Miller Cylindrical projection, which sounds really high-brow, except that it's the only projection that gave usable results in this case, since I didn't shoot a full 360 degree panorama for this image (I was just planning to do a first test of the camera...). This one and the next two all use a Fisheye projection, which forms a nicely circular arch of the Milky Way. In this projection, the stars in the upper corners are actually just above the horizon behind you, so you really need a full-sky panorama to make one of these. As you may notice, I tried out various exposure settings. Short, 4 second exposures are great for lazy people who want to get the shoot over and done with quickly, and also minimizes streaking of the stars. But you pay for that with higher image noise. Luckily the generous f/1.4 aperture allows such games. 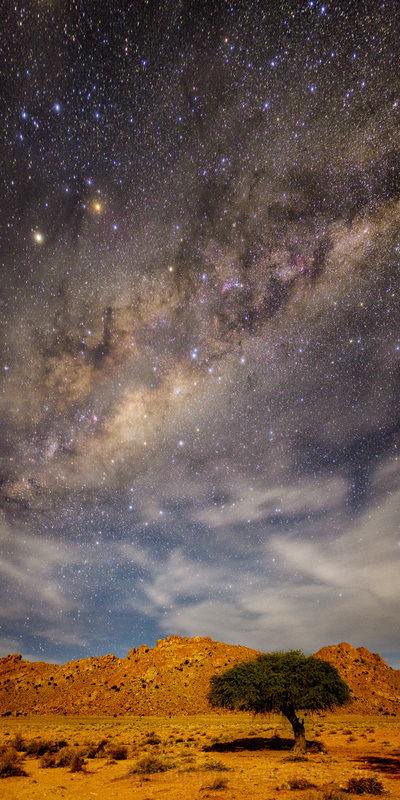 The downside: the foreground is slightly out of focus, which you'll notice if you print this large (so I don't recommend printing wider than about 50cm). This was the last one I took. On the way back I tripped over some kelp and injured my shoulder. Night photography is dangerous! Oh, all of the above images have a 16x9 aspect ratio, so they're well suited for desktop backgrounds. This is the same scene, but using an Equirectangular projection to produce a longer image (5x2 aspect ratio here), which I like because of the dark triangles on either side of the image, which add to the composition. 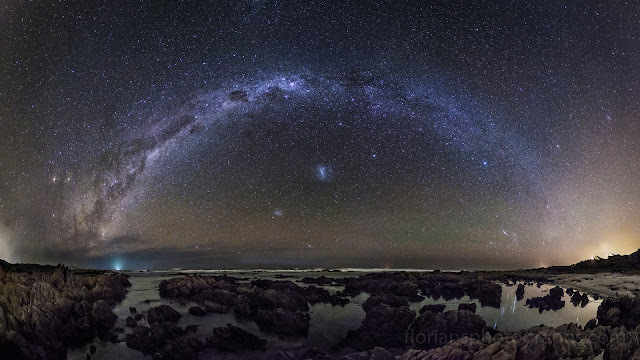 The two Magellanic Clouds in the center complete the image for me. It is my favorite of the series.